In any given year over the past few decades, Bizet’s Carmen may be the single most performed opera on earth. There’s reasons, of course: a strong story built around a few clearly defined characters, a collection of “hit songs” that could fill a late-night infomercial, and some searingly gorgeous orchestral music in between. Plus lots of Spanish dancing, smuggling and bullfighting. No wonder, right? As with any such wildly popular opera – La Boheme, Madama Butterfly, Rigoletto – the question becomes not whether to do it but how? Audiences need the shove of something new each time, but generally speaking (in all but the most avant garde world capitals) also require the comforting salve of the oh-so-familiar. This becomes something of a game in the end, having a little fun with the traditional components, but never “too much” fun. As performed by Houston Grand Opera, and produced along with San Francisco Opera and Lyric Opera of Chicago, the current production of Bizet’s masterpiece is just about perfect. And as a showcase for one of HGO’s homegrown stars, Ana Maria Martinez, it’s exciting stuff indeed. We’ve been lucky enough to catch her in one of the finest Bohemes ever, back in 2002, as well as in Butterfly in 2010 and 2011, but her native Puerto Rican sensitivity to Latin rhythms and Latin passions makes her a Carmen for her generation. Her singing is bold and expressive, from soaring (or softly feminine) high notes to the lowest utterances meant to connect the character to unfettered sexuality and the street. Martinez proves no slouch at flamenco either. Not bad for a fiery Spanish gypsy cigarette girl – in an opera sung entirely in French! 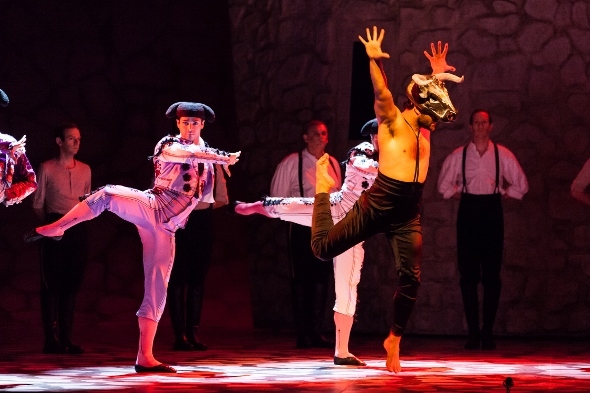 Since Carmen the woman is essentially (we might even say elementally) torn between two lovers, both her romantic soldier boy Don Jose and her macho bullfighter Escamillo have a lot to say about her ability to generate heat. We love tenor Brandon Jovanovich as Jose, not least because he can pour on the sweetness that’s written in this music (his highlights-reel “Flower Song” in particular), sidestepping the breathy belting that has caught the bus up from Broadway to Lincoln Center. Bass-baritone Ryan McKinny, like Martinez an alum of the HGO Studio, starts off a bit stiff as torero (no, not toreador, no matter what the terrific song calls him) Escamillo, but that seems mostly choreography. He’s allowed to loosen up later, particularly in his confrontations with Jose as Carmen’s affections shift in his direction. One of the less-noticed jewels of Carmen is the quiet-faithful country girl Micaela, who keeps showing up with news from Don Jose’s mother, of all people. Obviously, she’s mostly a contrast with Carmen, but she gets two of the loveliest musical stretches in the opera: a recurring theme that works as a duet in Act I plus her often-performed “Micaela’s Air” in Act II. Soprano Natalya Romaniw sings this shimmering music with flourishes of youthful love and lyricism. 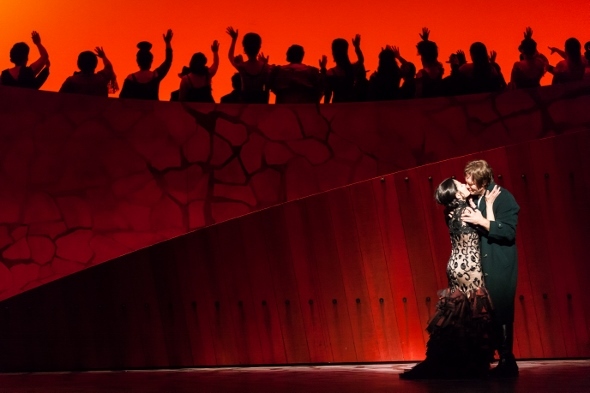 To be this good – that is, to work this well as live theater – Carmen needs a lot more than terrific singing. Generally, Rob Ashford delivers the goods as both director and choreographer, the two being more intertwined here than is often the case. Against a dazzling 1930s set (especially the De Chirico-meets-Dali bullring of the final scene) by David Rockwell, Ashford gives us not only passionate acting but a series of dance treatments that manage to intensify rather than distract. The flamenco scenes are wonderful, as is the metaphorical ballet of senoritas and bullfighters that pushes things toward their tragic conclusion. The final violence that is Carmen gets a riveting counterpoint in a pas de deux between a matador and the bull (the latter danced with masculinity and grace by Rasta Thomas) who has appeared with the opera’s brooding “fate theme” before he, like our heroine, meets a ritualized, preordained end.